Sarah Panter, Review of: Kristen Layne Anderson. Abolitionizing Missouri: German Immigrants and Racial Ideology in Nineteenth-Century America. Baton Rouge: Louisiana State University Press, 2016. 272 pp. $48.00 (cloth), ISBN 978-0-8071-6196-8. Until a decade ago, it seemed that almost everything had been said about the experiences of nineteenth-century German immigrants in the United States. In recent years, however, historians have provided fresh perspectives on broader aspects of the social, political, and cultural history of the German-speaking diaspora in the United States. This is especially true of the second half of the nineteenth century and becomes visible, for example, in the claims for a “transnational turn in Civil War history.” As a result, younger scholars have adapted new methodological approaches and started to open up the international potential of this research field by emphasizing the need to contextualize the attitudes of German-speaking immigrants and how they negotiated social, cultural, and racial differences in an entangled transatlantic space. In this larger context, Kristen Layne Anderson provides a valuable and well-written study. Anderson aims to question the image of German immigrants as idealistic fighters for humanity and as indisputably radical abolitionists in the border state of Missouri, particularly in St. Louis. In so doing, the author shows convincingly that “the racial ideology of the majority of German Americans in St. Louis was quite pragmatic, in that they shifted their position on slavery and the place of African Americans in American society when it benefited their own community to do so” (p. 3). Correspondingly, German Missourians took different stands on questions of race, gender, class, and religion between 1848 and 1870. The study’s arguments are supported by drawing on a broad range of sources, including the German- and English-language press representing different political orientations, statistical material from census documents, and personal and family papers. The six chapters are arranged chronologically and mainly follow political events and dynamics with regard to the questions of slavery and racial equality. Chapters 1 and 2 focus on the period of the early 1850s, showing how slavery became an increasingly important and politicized issue after the Kansas-Nebraska Act of 1854. Before this watershed event, many German Missourians had shared an “ambivalence about the institution of slavery” with the majority of their native-born counterparts in the North (p. 18). Whereas up to that point they did—far more than historians have usually tended to acknowledge—accept slavery’s existence, fears about its negative impact on white farmers and workers grew into a major concern. One important reason for this changing attitude was that the discussion about slavery had become entangled with questions of further expansion to the West and the possible opportunities for immigrants to settle in these new territories. The impact of slavery on the enslaved themselves was, however, still a marginal issue, even among more radical German abolitionists in St. Louis. As the opposition of German Missourians toward slavery grew, and German-language newspapers started to portray (fugitive) slaves as “actors in their own right” (p. 53), anti-German sentiment in Missouri became stronger, too. Nonetheless, these external pressures did not always have a unifying impact on German Missourians, sometimes leading instead to internal divisions. The community became increasingly polarized between conservative Germans and the more radical ones who claimed to be the standard-bearers of the ideals of the European revolutions of 1848. Chapters 3 and 4 shed new light on the role of German Missourians during the Civil War, their affiliations with the Republican Party, and their shifting concepts of emancipation. 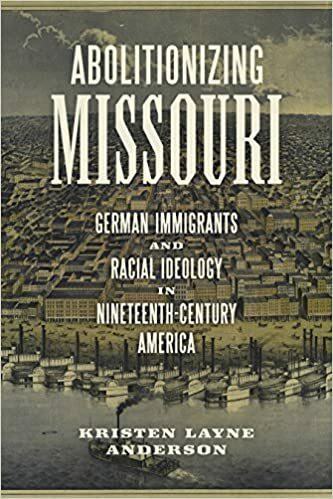 In these chapters, Anderson convincingly revises long-lasting exaltations and myths accompanying the role of German immigrants for keeping Missouri in the Union. Although, for example, fears of secession were widespread among German Missourians, they very often supported the Union and the Republican Party because they feared that to do otherwise would compromise their economic and political power in this border state. Yet “dissension in the ranks” did occur (p. 90), showing the important interplay of ethnicity and religion, with German Catholics and Lutherans supporting the South. After the Emancipation Proclamation of January 1863, radical and conservative Germans drifted even further apart. Whereas radical Germans pushed for immediate instead of gradual emancipation, conservative ones, threatened by ever-increasing nativism, tried to counter nativist attitudes by aligning themselves with the racial ideology of native-born whites. With important shifts in the social hierarchy, especially in St. Louis, African Americans became more visible in the everyday lives of many white Missourians. Their perceived invasion of a white space shattered the prewar racial hierarchy and also fed German Americans’ anxieties. Chapters 5 and 6 round up the arguments by focusing on how German Missourians’ attitudes changed during early Reconstruction when they were confronted with questions of black equality in public spaces, like schools, but also regarding the potential threat of interracial gender relations. Sometimes violence erupted over these conflicts and the Ku Klux Klan, as in other regions, found a welcome justification for its actions. Whereas conflicting opinions concerning black suffrage existed already before and became more visible after 1865, the passing of the Fifteenth Amendment in 1870 led to a strategical realignment. Fearing now that black voters could hurt immigrant interests and not vote with them, “most German Republicans ultimately turned against black suffrage” (p. 170)—despite previously portraying themselves as one of its strongest supporters. In part because of the issue of black voting, German Missourians contributed to a split with the leadership of the Republican Party. Although the author’s approach contributes significantly to dismantling misleading stereotypes of German Missourians of the past, more contextualization would have increased the book’s significance. A systematic integration of a transnational approach to immigration history would have emphasized the entanglements between the North American, European, and regional contexts in the German Confederation more strongly and precisely. Similarly, embedding German Missourians more firmly in the US context would have provided the basis for broader and more systematic reflections on their similarities to and differences from other ethnic groups in Missouri or German Americans outside of Missouri. All in all, Anderson demonstrates convincingly the very complex situation of German Missourians between 1848 and 1870 and their struggle for citizenship and finding a place in the racial hierarchy of the United States. Her study is therefore not only a welcome contribution to the history of German-speaking immigrants in Missouri but also a well-researched local case study and reevaluation of the attitude of ethnic groups toward slavery and racial equality during the Civil War era.
. Patrick J. Kelly, “The European Revolutions of 1848 and the Transnational Turn in Civil War History,” Journal of the Civil War Era 4, no. 3 (2014): 431–443.
. See, in particular, Alison C. Efford, German Immigrants, Race, and Citizenship in the Civil War Era (New York: Cambridge University Press, 2013); Mischa Honeck, We Are the Revolutionists: German-Speaking Immigrants and American Abolitionists after 1848 (Athens: University of Georgia Press, 2011); and Heléna Tóth, An Exiled Generation: German and Hungarian Refugees of Revolution, 1848–1871 (Cambridge: Cambridge University Press, 2014). Citation: Sarah Panter. Review of Anderson, Kristen Layne, Abolitionizing Missouri: German Immigrants and Racial Ideology in Nineteenth-Century America. H-TGS, H-Net Reviews. September, 2016. This entry was posted in Actualités / News, Books, Reviews and tagged Abolition, Human Rights, Transnational History by Sarah Panter. Bookmark the permalink.